Gruv Gear, Orange County California-based designer and manufacturer of innovative utility carts, music products and accessories, announces its contribution and support to Sweet Relief Musicians Funds, and organization dedicated to help career musicians career musicians who are struggling to make ends meet while facing illness, disability, or age-related problems. "Sweet Relief has created an amazing program where everyone can take part and lend support, from large acts including Red Hot Chili Peppers, Dave Matthews Band, and Cold Play. We're honored to be a part of this effort." So many great American artists are finding themselves in a hopeless position with nowhere to turn. Sweet Relief was founded by singer-songwriter Victoria Williams in 1993. Victoria, while on a career-making tour with Neil Young was forced to drop off mid-schedule after experiencing unexplained debilitating symptoms. A long and painful diagnostic process revealed she had multiple sclerosis. After her diagnosis, a group of friends assembled an all-star album of Victoria’s songs, Sweet Relief, which alleviated much of her medical debt. Vic, knowing that there are many musicians like her - unable to afford medical expenses and compromised in their ability to work - donated some of her proceeds from the album to found Sweet Relief Musicians Fund. 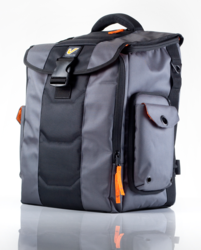 Gruv Gear's contribution of its top-of-the-line multi-use backpack for traveling musicians, the Stadium Bag, was a well-appreciated gift to the cause. "As a musician, I'm well aware how much we rely on our main tools… Our hands, our minds, our health" says Jay Baldemor, President of Gruv Gear. "Any disability or health issues directly affect our performance, and for many, their careers and livelihood. Sweet Relief has created an amazing program where everyone can take part and lend support, from large acts including Red Hot Chili Peppers, Dave Matthews Band, and Cold Play. We're honored to be a part of this effort." To learn more about Gruv Gear and its multi-mode convertible carts and handtrucks including the V-Cart Solo, Solo Lite, Solo XL, and Muver 6, and innovative tech backpacks including the Stadium Bag and upcoming Club Bag, please visit http://www.gruvgear.com. Gruv Gear continues to flex its marketing muscle with grassroots clinics and events, exclusive online campaigns, and major artist endorsements. The company have already made avid endorsers out of some of the world’s top artists, including musicians from American Idol and Cirque du Soleil, Michael Jackson’s “This Is It” players Alex Al and Jonathan Moffett, Peter Erskine (multi Grammy-winning drummer, Weather Report, Chick Corea, Yellowjackets), Jon Myron Clark (Michael Jackson “The Immortal” World Tour by Cirque du Soleil), Anthony Wellington (Victor Wooten Band), Norm Stockton (Lincoln Brewster), DJ Icy Ice (World Famous Beat Junkies, Kanye West and Black Eyed Peas Parties, Grammy After Parties, Manny Pacquiao After Parties), and Ray Roman (award-winning cinematographer and named one of the top 25 studios in the world).